Among many Shinto shrines, Ise Jingu, the Grand Shrine of Ise is the most revered shrine in Japan. The compound consists of two primary buildings, the Kotaijingu and the Toyouke-Daijingu. The Kotaijingu is also called “Naiku”, where the supreme deity Amaterasu-Omikami has been worshipped for 2,000 years, as the predecessor of the Imperial Household and the supreme deity of Shinto. The Toyouke-Daijingu, also known as “Geku”, is dedicated to Toyouke-Omikami, the provider of sacred foods to Amaterasu-Omikami. Toyouke-Omikami is also the guardian of well-being and provides clothing, shelter and food to the Japanese people. 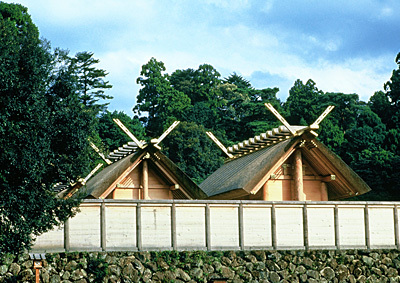 In Ise Jingu, more than 1,500 ceremonies and rituals are held annually. The largest and most important ceremony among all the ceremonies held at Ise Jingu is called Shikinen-Sengu. The system of Shikinen-Sengu began 1,300 years ago, and is held once every 20 years. Each shrine building is meticulously disassembled and rebuilt, treasures and artifacts are refurbished, and the apparels for the deities are newly prepared. By doing this, Japanese people renew their mind and faith in the deities and ensure the continuity of rejuvenation for the divine spirits. Traditional Japanese culture and skills are also passed on to the next generation.